Tower defence games aren’t really a new concept on DSiWare, and with already a few titles in the genre available, you might wonder whether this one has anything special to offer. It turns out that GO Series: Defence Wars gives a nice twist to tower defence that makes it a bit more interesting. In most tower defence games, the only real user input comes from thinking up good strategic positioning and then placing the towers, after which you can usually sit back and watch as your forces rip through the enemy hordes. In Defence Wars, however, it’s not just the placement of towers that’s important – you’ll also have to take control of them and fire at enemies yourself. 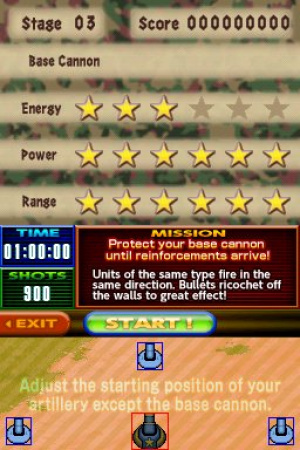 This game’s towers, or rather, turrets, can be placed only at the very bottom of the lower screen, which is done before each level. You’ll start out with a “base cannon,” which is also the most important turret you’ll get – it appears in every mission, and if it’s destroyed, you lose. It has plenty of upsides, though. It’s the only unit you’ll get that has infinite ammo, and the cannon shells that it fires are pretty dang strong, creating a sizeable explosion that does a good chunk of damage to anything caught in the blast. As you go through the levels, you’ll quickly begin getting additional units to place, starting with some smaller turrets. These aren’t as strong as the base cannon, but they can fire much faster, meaning that if you happen to miss a shot it’s usually not as big of a deal. 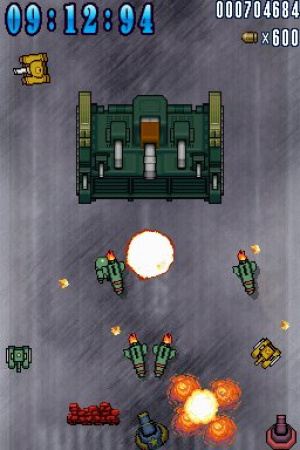 However, as previously stated, the base cannon is the only unit with unlimited firepower – using these other turrets means you’ll have to keep an eye on the on-screen ammo count. In later missions, you’ll have to try to only use them when necessary. By this point, you might be thinking that it could get quite hectic – with several different units to control, how on earth are you going to switch between them fast enough? Thankfully, the game has a solution for that: if you select a unit, you’re actually selecting all units of the same type. They’ll all mirror each other’s movements, so if you fire straight up with one of the small turrets, all of them will. This means you can generally take care of both sides of the screen by simply placing one turret on the left and one on the right – at least, early on. Keep in mind, though, that the base cannon is not the only thing enemies will attack – your turrets will take fire and eventually be destroyed, and since you won’t get replacements, that generally won’t be favourable. 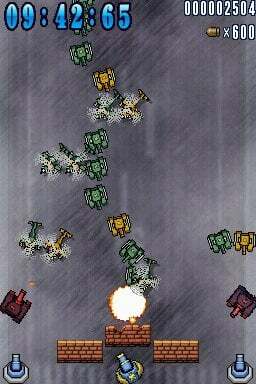 Before long, the game will also add tanks to your army. These act a bit differently in that they fire at enemies themselves – your interaction instead comes in being able to move them around. Simply put them near the enemies and they’ll begin firing. Later on you’ll get some units that don’t even attack, in the form of stacks of sandbags. They act as damage sponges of course, but they also add the side effect of obstructing your own shots. You'll have to be careful not to block your most important units right off the bat! In all missions, your objective is to simply survive without your base cannon being destroyed. Generally, this means fending off the enemies for a minute or two until reinforcements arrive, but every few stages you’ll also have to fight a boss. You won’t win simply by surviving in these; the boss must be destroyed. The graphics are nice, cartoony and really not too bad. The score is comprised of similarly wacky, somewhat catchy military music, but with only two or three tracks there’s not much variety. Although the game is quite addictive, it is unfortunately over fairly fast. There’s only around 20 levels to go through, and aside from attempting to achieve new high scores, there’s nothing else to keep you occupied. Overall, Defence Wars is another successful 200 Point entry in the GO Series. It doesn't have much content, but what's there is fun and will give you a good time while it lasts. If it comes to the US I might get it. looks good! I really liked this game for some reason. And for 200 points it has lasted long enough and I still have a few levels left. A successor with more options, variation and levels could be really great. This would go nicely with Army Defender. This sounds like what Army Defender should have been. AD was fun but you couldn't play it in short bursts and the only thing to do was beat your scores. Is there a level select in this game unlike Army Defender? Yeah same question here.. can you select a starting level? Also, are there any highscores,and STATS? It was fun, but the shooting controls with the movement of the stylus were unresponsive for me sometimes, usually in the worst of situations.